Samsung's new flagship mobile phones go on sale today but the company says it may struggle to meet demand for its S6 Edge model. Although Samsung predicts greater interest in its more conventionally designed S6 model, it is worried about the time it takes to manufacturer components for the distinctive wrap-around touch screen on the S6 Edge. Experts say it could lead to consumers having to order and then wait for the model, and delay any fall in its price. Samsung faces strong competition from Apple at the high-end of the market while much cheaper smart phones made in China challenge its position at lower price points. Mobile analyst, Thomas Husson at Forrester told the BBC: "They [Samsung] will have a serious issue if the shortage is due to the difficulty of producing the curved screen. 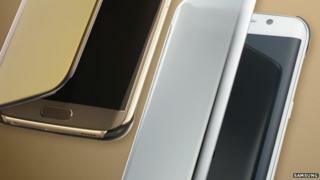 "Samsung must succeed in the launch of these new flagship phones to regain leadership in the high-end segment. They have a window of opportunity until the new iPhone comes out. The product and design is great - but [it] lacks service differentiation." A Samsung UK spokesperson told the BBC the company was "working hard" to fulfil pre-orders and sales "as soon as possible".